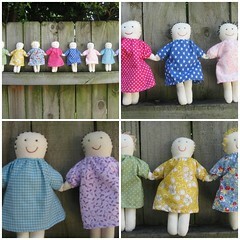 Dolls For DoctorsOriginally uploaded by Sew SydneyIt has been a fast paced week! More sick kids and a much needed girls lunch in Manly has kept me going! Really, when will we stop catching all these gross bugs?We have decided to put our house on the market next year for auction. All of a sudden there is just so much to do on top of a already crazy time of year. Ahhhhh!!!! Here are some photos of the recent project. I really wanted to make something that I could auction on Ebay to raise money for charity. 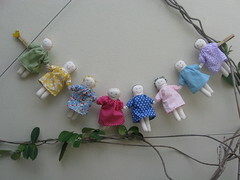 I hope I can find a few bidders for these home-made, soft dolls that are sewn in a garland. There are eight in a row and I will post lots of photos of them on my flickr site. Tonight I will organize the Ebay auction and hopefully send some gorilla marketing to friends and family to get some bids! Will keep you posted on the dolls tonight or tomorrow with Ebay details! Home on very hot, steamy day with poor sick little boy on the couch watching A LOT of television. You know he is really sick if he isn’t moving at his normal warp speed. Poor little guy caught the nasty gastro that is going around. I feel like we are on the merry-go-around of germs and bugs at the moment. When will it end??????? Someone is getting very excited for our Christmas tree which should arrive in two weeks courtesy of the scouts. We made these two backhoe loader Christmas ornaments this weekend. One is for Rhys (blue of course) and the other is for his good friend who is also backhoe loader mad. Rhys has a superhero party this Friday and wanted to wear his long sleeved backhoe t-shirt. I quickly made this short sleeved version so he won’t bake too much in this steamy weather. One of the photos is of Rhys holding up his all-time favorite book of the moment, “I’m Dirty” by Kate and Jim McMullan. 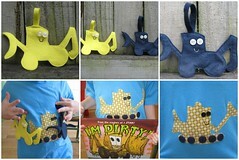 This is such a fun book to read and we based our t-shirt on the backhoe in the book. We originally discovered this gem at the local library and it was such a hit we had to buy a copy for home. They have also written a book called, “I Stink” which is excellent. Have a great week all and happy holiday sewing! I am having a less than stellar day of parenting today. Sloan is sporting a fat lip from falling flat on her face after playing with her dolls pram first thing up this morning. Blood spurting everywhere and huge lip. Then, she was “helping” me clean out some dresser drawers and swallowed the cap of a chapstick. Nice. I could not fish it out of her mouth and then……gulp! Down it went. I frantically called the doctor who assured me that it’s size and shape should pass without a drama in the next few days. We have a friend’s 40th tonight and I think I am going to need a drink to recover! Enough drama! Here is a house that Rhys built for his music class. Each child brought a house they built and together they created a city. Rhys’ pride and ownership of this house just touched my heart. It really does show how creativity builds something in their souls other than just playing with bought toys. Looks a bit Christmassy doesn’t it with the green chair behind? I bought this pillow kit in Maui two years ago!! 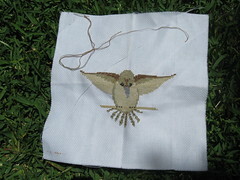 I actually finished the applique part eight months ago, but I could not find a good backing fabric. I found it when I was excavating the sewing basket and taking stock of just how many started and not finished projects I have out there! You are supposed to quilt all around the top, put a zipper in the pillow, etc. I did none of the above. I didn’t really enjoy this project because I found the quality of the fabric really poor and not enjoyable to sew with. Trying to get the points right drove me batty and nothing ever looked quite even meanwhile the fabric frayed badly. Nevertheless, I am calling it done and proudly displaying the finish what you have button. Bad news is I bought a blue small quilt kit from the same shop. I was so annoyed with it I thought I would donate it to St. Vincents because of the same issues. That being said, now this project is finished I think it looks good from far away. Might keep the other project as a hand sewing travel long term goal. Jury is still out though. I hope everyone had a fabulous weekend. 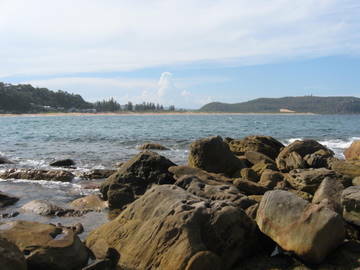 We spent a perfect Sunday at Palm Beach with friends who bought a sweet sandstone cottage on the hills. 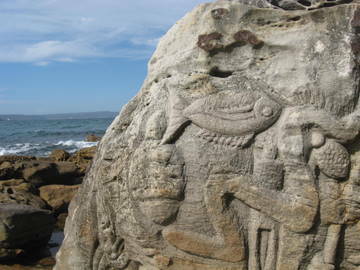 Food, company, weather, and even children were perfect. Monday I came crashing back to reality with a bad cold. Not a lot of sewing and crafting, but a lot of nose honking. 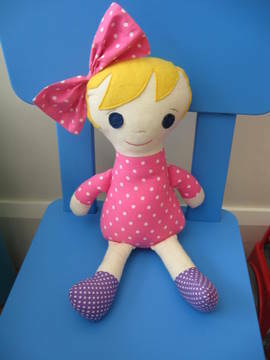 I did manage to finish a Wee Wonderful doll I had lingering in my sewing basket for the Mirabel appeal that Meet Me At Mike’s organized for children who have parents with substance abuse issues. Hats off to the organizers of this charity sewing drive! You guys rock! Like I said earlier, not a lot of crafting mojo at the moment. I have my babysitter this afternoon booked so I can hit the shops and I think I am going to need a hit of caffeine and Sudafed to get me through the rest of the afternoon. I am finishing a few projects: a pillow I bought in Hawaii two years ago, a small Sydney scene that was supposed to be for the baby boy we were having that turned out to be a girl, more Russian dolls for Xmas pressies and a doll garland I would love to auction for charity, but not sure if I will get that done before Xmas. 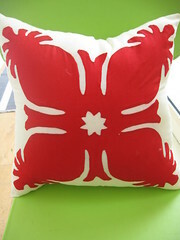 Has anyone seen Wise Craft’s post on the Amy Butler Gum Drop pillow? Here is the link : Wise Craft. I had seen the pattern before and was drooling over it, but now after seeing that post I am definitely going to go there. How gorgeous is her version? I see a pink one for Sloan’s room and a blue one for our family room with lots of family foot fighting over it.